Your daughter’s mind becomes more expansive with each new day. 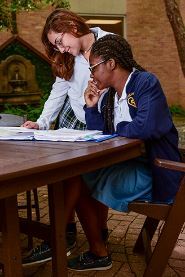 As your daughter’s learning universe fills with possibility, Duchesne surrounds her with an enlivening and intellectually serious community that propels her to develop her own clear voice and discerning mind. 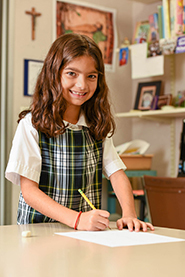 In our intimately scaled, all-girls’ classrooms, your daughter revels in an atmosphere of mutual discovery, discussion, and respectful debate. Her teachers and classmates know her heart and her mind. 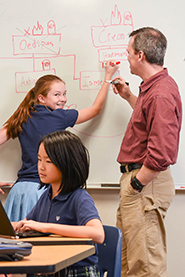 They provoke new perspectives on a classic text, new approaches to a math problem, and newfound joy in learning for its own sake. As she progresses through Duchesne, simple arithmetic grows into complex calculus. Reading and writing approach—even surpass—what’s expected at many colleges. Research skills evolve with her age and capabilities. And her understanding of her ability to change and shape her future gains profound clarity. I was absolutely blown away by the juniors and seniors I met at Duchesne. They are more impressive than some of the MBA students I coach. They were so poised and articulate.